Currently viewing the tag: "clamps"
Clamp Jet’s Saw Buddy to your sheet goods when you start a cut, and it’ll support the cutoff side. This leaves your hand free to catch the other end when you finish the cut. By preventing the cutoff from twisting or bending, the Saw Buddy keeps the kerf open so it won’t pinch the saw blade, which theoretically should give you a cleaner cut. Veritas’ new Bench Blades use a cam that can apply up to 300 lbs of clamping force to keep your latest project from moving around the bench. 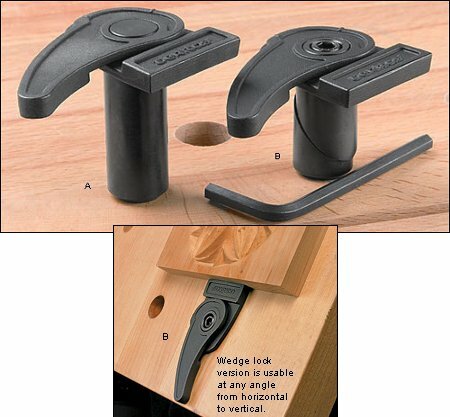 Fitting into most 3/4″ dog holes, these modified bench dogs only extend 1/4″ above the bench surface so they won’t get in the way of your tools. 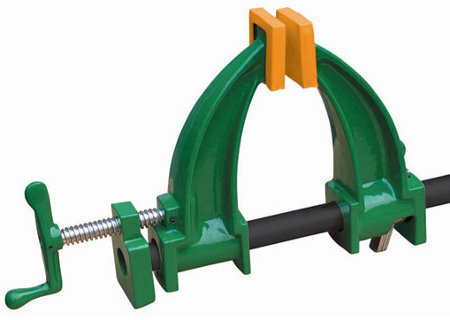 The cam lever and the sliding jaw are both made from cast steel and are heat treated. The lever moves the sliding jaw up to 1/4″, and the jaw face is cast so that the upper edge contacts the workpiece before the lower edge to help prevent the workpiece from lifting off the bench. 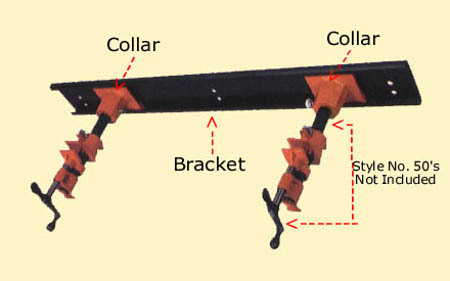 You can use bar clamps, parallel clamps, or a vertical clamping system like Hawk’s to glue up a flat panel from several small pieces, but you have to watch out for the panel warping or cupping. 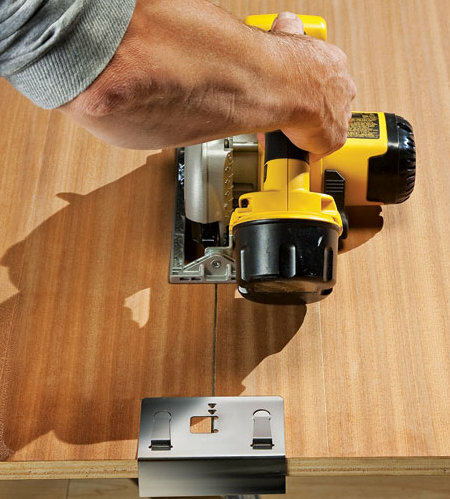 The Plano glue press ensures flat panels by exerting force on both the edges and the top and bottom of the panel. Advanced Machinery claims that by using their system you don’t need other alignment methods like dowels or biscuits, and the panels come out flat so there’s no additional planing or sanding required to get a flat surface. 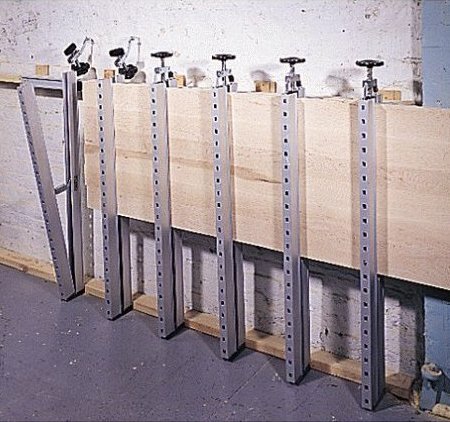 The clamps mount vertically on a 39″ rail to save space, which also supposedly reduces drying time. You can make panels up to 5″ thick and can expand the system to make almost any length of panel, but they recommend one clamp at least every 12″. 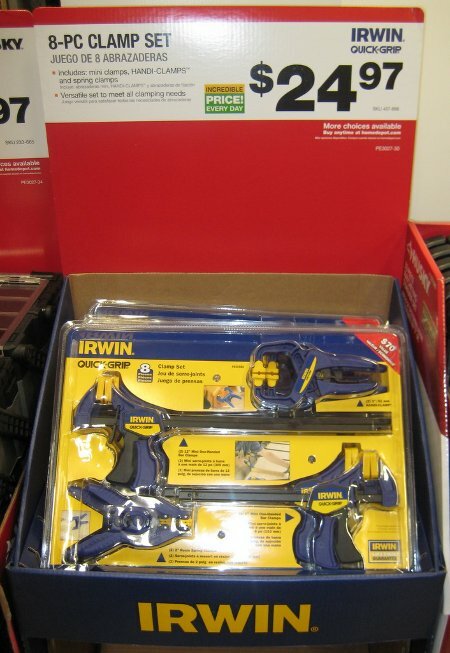 Detroit-area Toolmongers are probably familiar with Production Tool Supply and their deep discounts on overstocked in-store products. 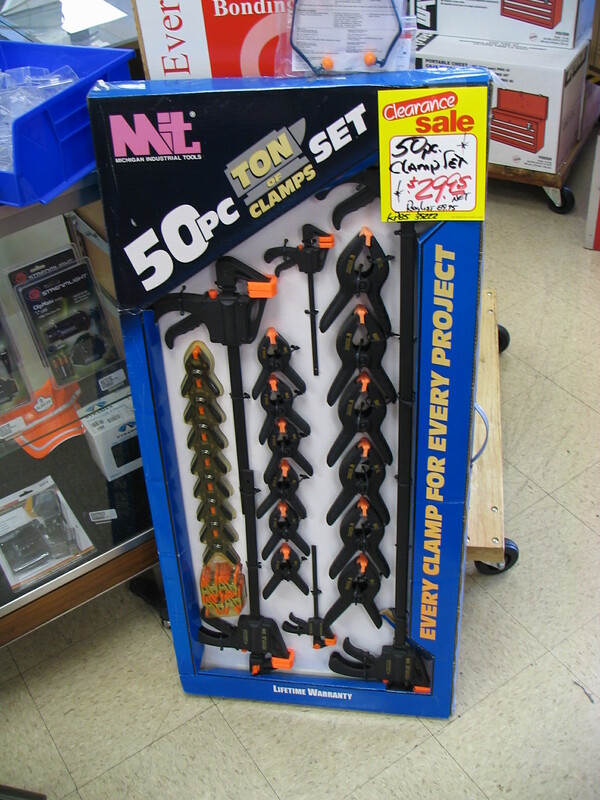 I was picking up some tooling today and saw a set of fifty MIT clamps (labeled “Ton of Clamps”) marked down from $90 to $30. MIT’s a pretty good manufacturer, so you can expect a lengthy service life. 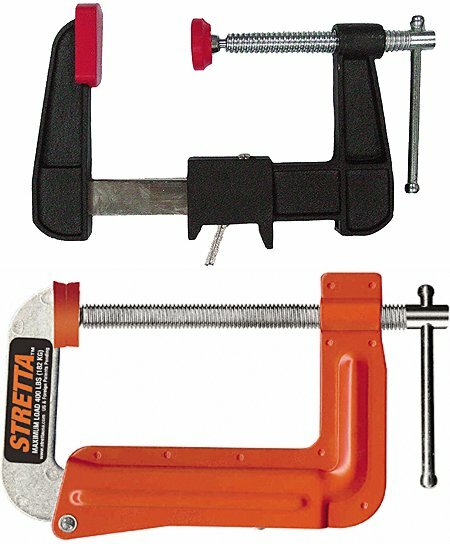 Sizes range from tiny 2”-jaw spring clamps to 3′ Quick Grip-style framing clamps. It’s in-store only, so anyone in Michigan can be knee-deep in clamps for a three-pack of X-bills. Or you can shimmy over to the Andersons’ website to pick up the same product for $38 before shipping. 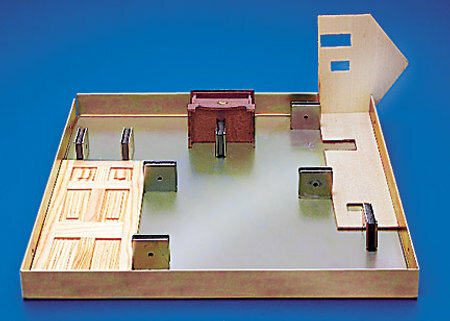 Figuring out how to hold small parts together while gluing can give your imagination a workout, but if you had this magnetic gluing jig from Micro-Mark, you’d no longer have to dream up wacky jigs to connect those small pieces. Whether you’re grinding, drilling, or milling, sometimes a simple V-block isn’t enough to hold your workpiece steady. 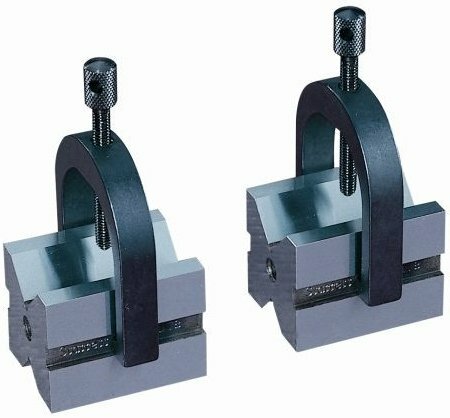 That’s where a V-block and clamp set would really come in handy — they’re usually sold in pairs like this Series 278 set from Starrett.